With four-hundred acres of park to explore, Carowinds amusement park is the roller coaster capital of the South! Carowinds has something for everyone, from Camp Snoopy for the kids to the Thrill Zone for riders who are looking for that adrenaline rush! With a Carowinds package discount through aRes Travel, you can enjoy everything Carowinds has to offer for less! Carowinds is proud to announce brand new Camp Snoopy attractions for its littlest visitors. Beagle Scout Acres is Carowinds’ eight-thousand square foot play area with interactive elements. There are also lots of shady spots where parents can relax. There’s Camp Bus, a miniature flying carpet ride, and Peanuts Trailblazer, an off-road adventure with the Peanuts gang. No visit to Carowinds is complete without meeting Snoopy in person! Carowinds is a prime East Coast rollercoaster destination. 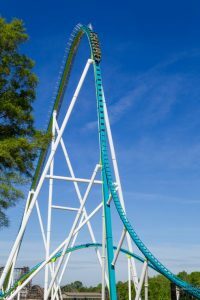 Favorites include Fury 325, the tallest giga-coaster in the world. The hotly anticipated Copperhead Strike, the first ever five-inversion, double-launch coaster opens in 2019. Don’t forget the classics like the Drop Tower that will drop you 174 feet at a heart-pounding 56 miles per hour. The Rip Roarin’ Rapids will have you hanging on for dear life and leave you drenched! 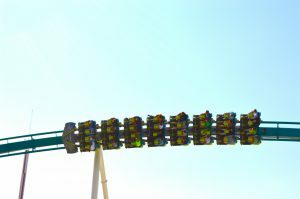 At Carowinds, thrills are around every corner. Relax and let aRes Travel do the hard work for you. We offer unique Carowinds package discounts that enable you to save money on your dream vacation. We can even bundle two parks together for even bigger savings! For giant discounts on cheap Carowinds tickets, the best savings on hotels, and exclusive deals on travel, call 1 (800) 434-7894 (international callers use +1 (619) 546-5622) to speak with an aRes Travel planning expert seven days a week, or book online now.